FANBOY PLANET.com . : mc-age-of-ultron :. 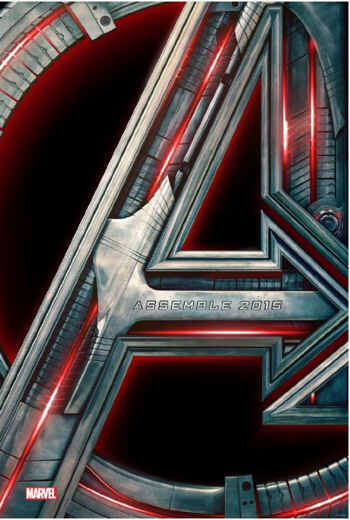 From the second the Marvel Studios logo fades, you're in the action. Despite a couple of solo movies that implied the Avengers weren't working together, the Avengers are working together, taking on the forces of Hydra in a European forest. Apparently they've been doing it for a while, trying to track down Loki's scepter. It's a breathless opening, pure fan service that echoes the climactic battle of the first Avengers movie. It's slick, it's satisfying, and it's a little... did we miss something? Well, maybe Marvel will release a comic book that explains it. At its best, Avengers: Age of Ultron runs at that pace, not letting you think about the pieces that appear to be missing. That pace isn't just action, either, though there's plenty of that. Writer/director Joss Whedon obviously wants to have great character moments, and he's driving a movie that tries mightily to have it both ways. There's a third way, too, and that puts a damper on things. The Marvel Cinematic Universe has gotten just big enough, the plans leaked far enough ahead, that it isn't enough to see great realizations of favorite characters on screen. 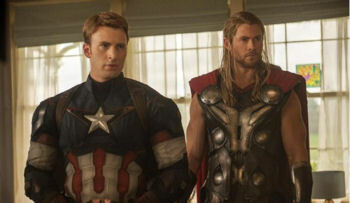 Age of Ultron turns out to be the beginning of their next great crossover event. We should have had a clue, since the coming movie titles all borrow from ridiculously overblown multi-issue, multi-series arcs, even if they're not identical to the books. Age of Ultron is a much more fun, more satisfying movie than Iron Man 2, but it's suffering from many of the same problems. There's too much going on in this movie that isn't about this movie. We have the seeds of Civil War in growing tension between Steve Rogers (Chris Evans) and Tony Stark (Robert Downey, Jr.). Though they can casually banter, there's a believable rivalry that comes from Captain America being 100% pure moral fiber, and Iron Man being a good guy but also pretty much a jerk. Whedon mirrors that nicely by making Ultron not just a creation out of control, but a dark reflection of Tony. With James Spader's voice, Ultron isn't just arrogant, he's funny on purpose. But only one character really realizes the connection the two have. Ultron also shoehorns in the beginnings of Black Panther, though really only die-hard fans will recognize it. Just notice that if you start wondering where a character went and they don't show up again before Age of Ultron is over, it will be picked up in another movie that will tangentially tie-in. I appreciate what Jeph Loeb said recently about the movies and TV: it's all connected. However, to be fully satisfying, it should all be able to stand on its own, too. 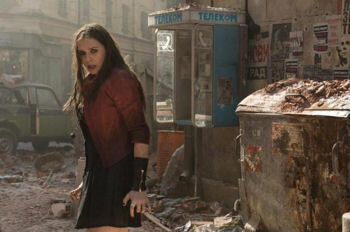 And though the threat of Hydra gets tossed aside fairly quickly, the through-line introducing Quicksilver (Aaron Taylor-Johnson) and the Scarlet Witch (Elizabeth Olsen) works pretty well, though Tony Stark's emotional culpability from Iron Man and Iron Man 3 definitely echoes here. For the quasi-scientific rationale that movies apparently require, Whedon and Marvel have made a pretty good definition of the Scarlet Witch's powers. You can still call them "probability altering" if you want. On top of telekinesis, she also has the ability to read minds and alter perceptions. This allows her to serve as macguffin, as she can tip Tony Stark's mind toward creating Ultron by ratcheting up his fear of anything larger than himself, such as "that guy you know is coming," Thanos (see Avengers: The Infinity War Part 1 and Avengers: The Infinity War Part 2). Thor (Chris Hemsworth) also gets sent spinning, into a vision that foreshadows Thor: Ragnarok. Sadly, nobody has any encounter with a talking raccoon, though good lord, Whedon could have done wonders with that. It's often a mess, yet so, so watchable. As promised, Hawkeye (Jeremy Renner) gets a lot more focus, and a reminder that Marvel brings in actors like Renner because they can take a shortcut to the emotional core while things are exploding around them. That includes, of course, Mark Ruffalo as Bruce Banner/The Hulk. Digital effects have taken another leap forward, and every time the green goliath appears, you can clearly see the man inside the monster, and the monster struggling to make peace with it. Rumor has it that Whedon originally turned in a three and a half hour long cut, and that will get a home video release. Avengers: Age of Ultron is so crammed at 140 minutes, that maybe the longer cut does have breathing room and a more organic way of bringing characters in and out of the narrative. What we have now is flawed, but fun, and despite those flaws, I suspect it will warrant watching a few times in the theater. And I can't believe I'm typing it but... yes, I will want that extended cut and watch that a few times. Dammit, Marvel, I just can't quit you.